My initial reaction to Guadalajara was indeed disappointment. I had come in from the Southeast via Avenida Revolución, which had something I have never seen anywhere else in the country: photo-radar speed control. And, astonishingly, everyone was driving at or slightly below the 60 kph speed limit. But this well-controlled speed didn’t keep it from being just another major Avenida through ticky-tacky outskirts. 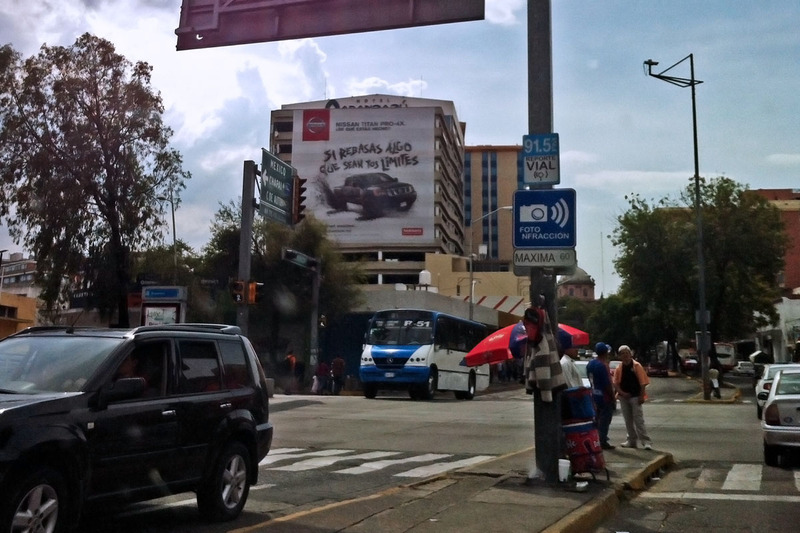 After a spell, this road dropped me into what I now know is probably the scuzziest part of the Centro Historico. I parked just Southeast of the Jardín de San Francisco, at the edge of the touristy bit of the Centro Historico, a place that looks sketchy, with a mix of run-down mid-century buildings, run-down colonial buildings, and a bunch of equally run-down looking people. “Why am I here?” was my first thought as I made my way around homeless people to find the main plaza. But as I’ve now spent nearly a week here, my opinion has changed as the city has grown on me. Sure, Guadalajara has let careless development ruin what could otherwise have been an amazing colonial center. While there are still many fine colonial and colonial-style old buildings, there are also many unattractive, decrepit mid-century buildings mixed in. But if you can overlook that, which I increasingly am, the city then takes on a sort of funky charm. There are still alleys that are completely colonial or old-fashioned, which have been turned into pedestrian streets dotted with cafes and boutiques. For example Andador Coronilla, a few blocks outside the centro is blocked to traffic and has some lovely cafés and an art school where students work on their canvases outdoors. 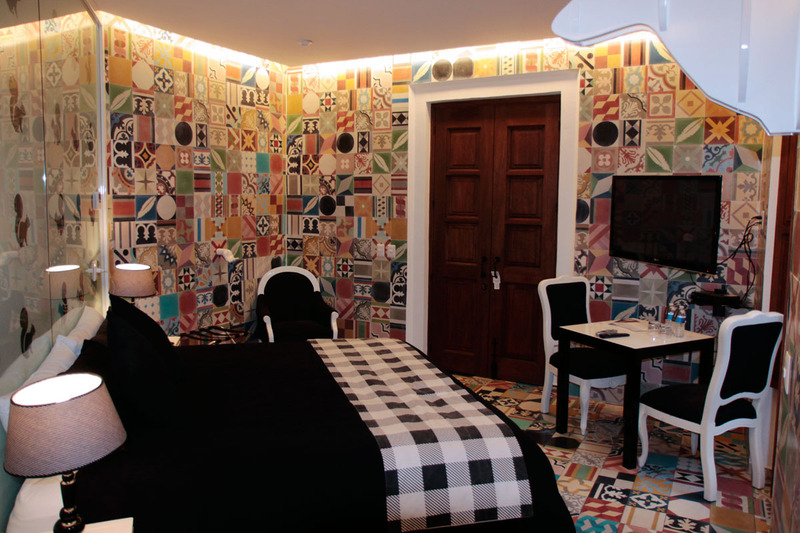 My hotel, “Del Carmen Concept Hotel” is a wonderful example of the mixing of old and new. 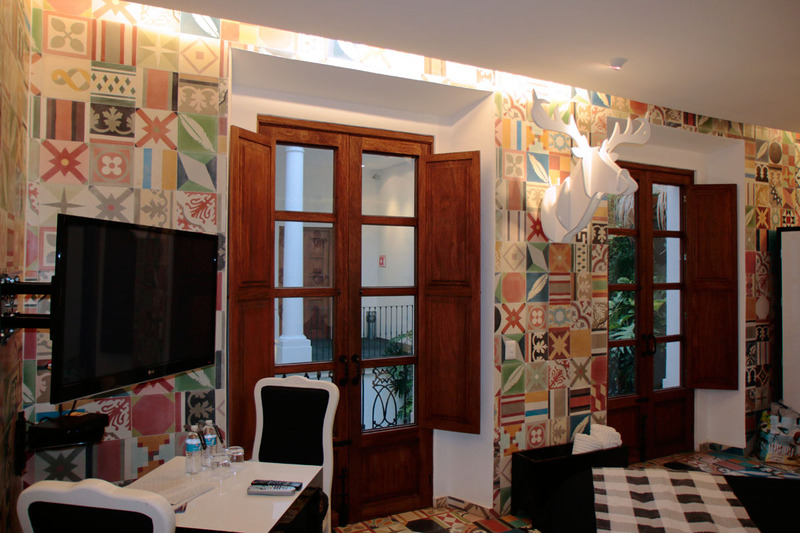 Situated in a renovated colonial mansion on the Plaza del Carmen, the hotel is a boutique hotel, with about a dozen rooms, each decorated in a style of a particular Mexican artist. I’ve had the fortune to stay in “Frideberg,” and “Vlady,” and had the opportunity to peek into several more. Personally, I think Frideberg is the most interesting, but any of the rooms is out of the ordinary, and a fun place to stay. The staff is super-friendly, and there’s a restaurant on the ground floor. The only complaint is that it can be a bit noisy, but I always travel with ear plugs, so I wasn’t disturbed. The hotel itself is well-situated, toward the edge of the Centro Historico, but easily within walking distance of many touristic sights. I’d highly recommend it. The price? I managed to pay $1,438 pesos per night, about $110 USD. While this is about twice what I normally pay for hotels in Mexico, it was a nice splurge. From the hotel, the city is quite walkable, with the iconic cathedral and surrounding plazas seven blocks east, and three blocks north, about ten minutes away. After settling in, I walked over to check out the plazas and ancient buildings. Honestly, the Cathedral left me cold. Though iconic, in my view the towers are out of proportion to the facade, and a glaringly different style, more Gothic than the Baroque style of the main part of the facade. The overall effect is pretty unharmonious. And it turns out this is a correct assessment, as the towers were replaced in 1854 (earthquake damage), while the main structure was completed in 1618. It’s also surprisingly difficult to photograph, being much larger than it appears, which makes it tricky to get it all in from the plaza. However, I rose to the challenge and managed to get a few good shots, aided by the beautiful light at dusk. The posterized photo at the top was taken from the plaza, though pre-posterization it was a bit on the dull side. The interior is somewhat bland, being mostly white plaster, with gold accents. Surprisingly, even the gold is a bit lackluster, looking more brass-like. 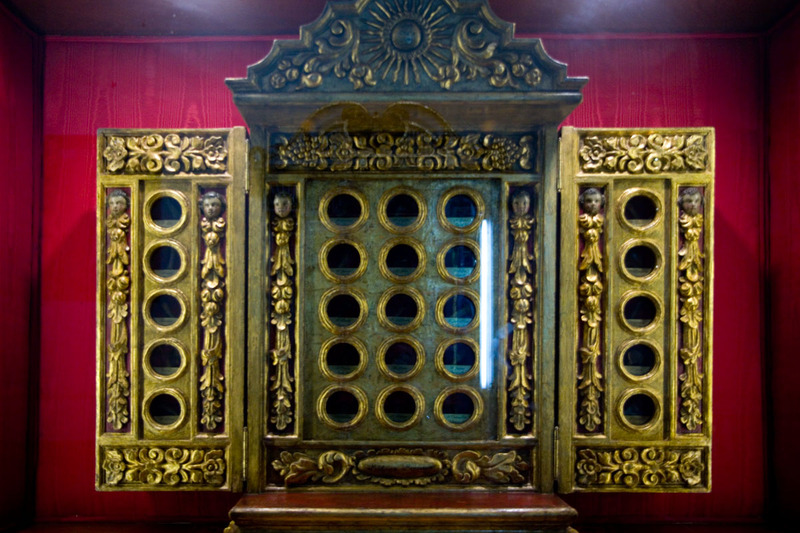 Within there was also a reliquary with bits of bones of saints and illustrious Mexicans. Frankly, it struck me as rather ghoulish. What other religion in this day and age maintains bits of the dead bodies of its saints and revered members? Who from the church asks the family if they might cut off a bit of their dearly departed to keep in the church? How exactly do they broach the topic? What’s the pitch? “Just give us the big toe, Sra Gálvez, and we’ll put in an extra word of recommendation with God.” Who knows? There was at least one vertebra in the case, so they’re not just going after easy parts. I was simultaneously fascinated and repelled. So where’s the clash of architecture, you ask? 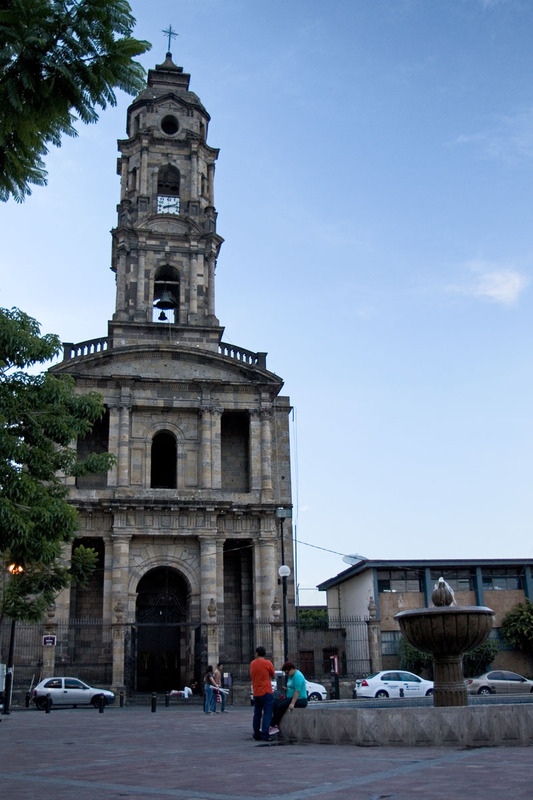 Well, the below is a good example, located on the Jardín de la Reforma, with a beautiful baroque church off to the left side. 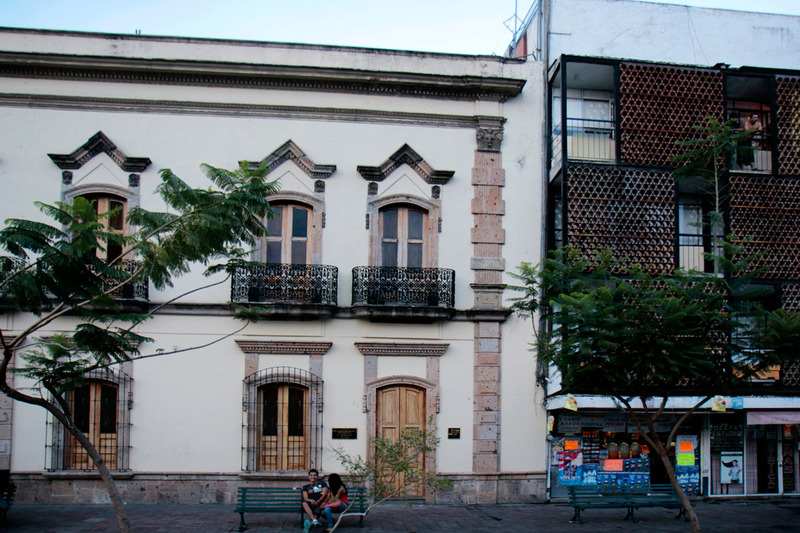 I can sort of understand allowing such a building along a side street, or farther out, but facing a historic plaza right in the heart of the Centro Historico?!?!? C’mon guys, you can do much better than that! Who permitted that building on the right, and what was he thinking?!? The church below is to the left of side of the photos above, and you can see a bit of the plaza. Though I’m not exactly in love with the building to the right of the church either, at least it makes a nod to its surroundings by using traditional or typical stone on the facade. If it ain’t Baroque, please fix it! In any case, despite some of the questionable architectural decisions in Guadalajara, I did enjoy wandering around, and of course I had Steve Cotton’s visit to look forward to. After a bit of prodding, he finally relented and agreed to meet me the next day. Saludos for now, and thanks for stopping by! As some of you know, I’m back in Boston now, suffering post-Mexico blues. Well, maybe not blues, but a certain sense of “back to the same old, same old.” I’ve actually been here for a few weeks and somewhat overwhelmed with the crush of little errands that have piled up. I’m going to keep posting for a while as if I’m still traveling, as there are more stories to share from the road. Thanks for your patience with my sporadic postings. 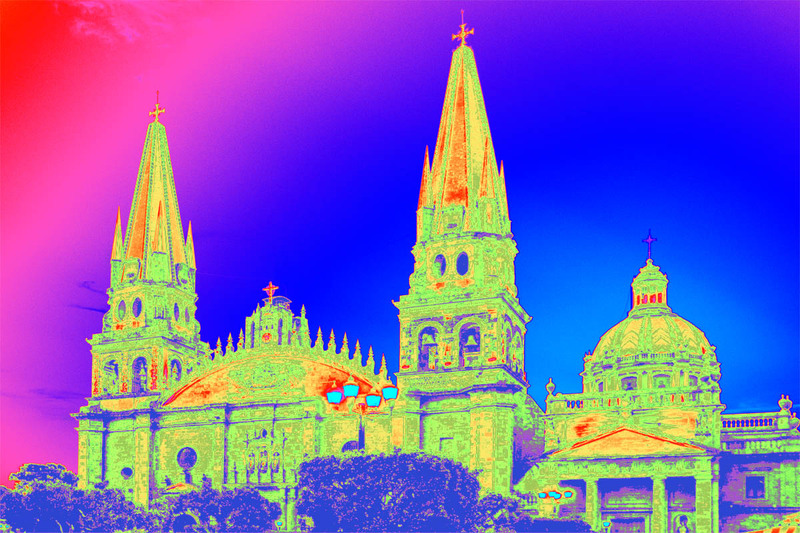 Prior to the earthquake of 1985 when 5-8 million DF people relocated to Guadalajara, it was a lovely, lovely city. Needless to say the influx of that many people had a negative effect on the budget constraints, the maintenance and many other parts of the city, sadly. I always thought I would live there. I exported out of there for 20 years. Everything that Steve could possibly want or need for his new home can be found in “the area” of Guadalajara but not necessarily in the city proper. Much of the fine furniture used in the USA, from USA companies is made in Guadalajara…. I spent most of my time in Tlaquepaque, Tonala, Chapala and other outskirts at the factories having items made. The artisans are magnificent! Glad you ultimately decided that you liked the city. One of the finest French restaurants I’ve ever dined at, including those in Paris, is located in Guadalajara! Enjoyed your post. I’m just now finding time to catch up on everyone’s posts for the last month. Hola Barbara!!! I’m glad you have some time to catch up on blogs. Mine’s been a bit a bit boring of late. 😦 But that kind of reflects my life of late. (All work and little play.) That said, there are still a few tales from the road that I need to write up. Are you sure about that figure for Defeños moving to GDL? Even the low end sounds hard to believe, given that GDL’s current population is right around 1.5 million. But whatever the number is, thanks for stopping by, and for commenting. Saludos! Ha! So now we’re in Mexico and you’re in New England. Turnabout is fair play! But tomorrow, we’ll be back home as well. We can drown our sorrows in contiguous states, and maybe together if we one day figure that one out! Hola Lee! LOL…. But you didn’t drive there, did you? Huh? Smart man!!! Yes, some day we need to meet up. Meanwhile, it’s beginning to feel more and more like fall, and I think my blood has thinned in Mexico. Today it was 69° outside and I put on a sweater, LOL. Saludos and thanks for stopping by! Hello, Kim…. it’s really so good to hear from you again… I liked this post about Guadalajara, and I think I can understand when you say that if you had to choose for big cities you’d go for Mexico City first. I have a pending rendez-vous with Guadalajara… but somehow I don’t feel an urge to fulfill it. Perhaps the ghost of Francisco and a short-lived and disappointing romance is what prevents me from going there again but, who knows? One of these days I might go for a weekend and then reconcile myself with Guadalajara for good. Hugs! Thank you for visiting my blog the other day. Hola Tino! 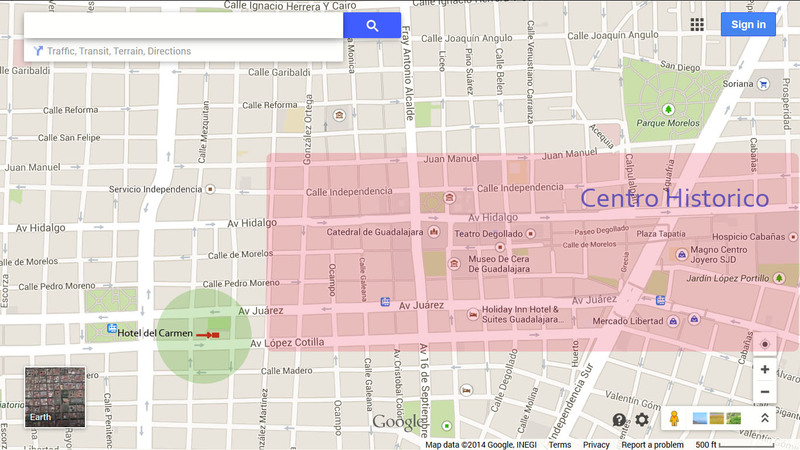 Certainly Guadalajara has a lot to offer. People are very nice, and there’s definitely a large and noticeable gay presence. And in the interests of full disclosure, there’s plenty I didn’t see like Tlaquepaque or Tonalá, but if I were you, I’d go to Zacatecas first. It’s stunning, and the people are beautiful and friendly. And it’s closer to Monterrey, though I suppose you could more easily fly to GDL. Saludos y abrazos!!! Nice summary. As you know, I rode the same analytical roller coaster. My first impression of centro was not good. Now, I would (and will) return as often as possible. I will soon need to make some purchases for the house. 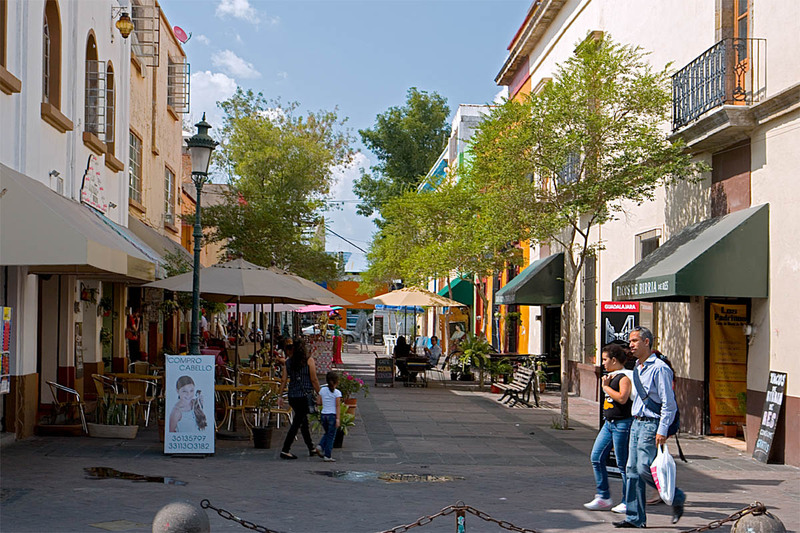 And Guadalajara is the natural shopping candidate. Hola Steve! I’m sure that Guadalajara will have to be the source of things like lighting fixtures for you, and probably furniture too. Best of luck with the new house! I enjoyed GDL, particularly the company, but I doubt I’ll be rushing back. That said, there’s still plenty I didn’t see. Saludos and thanks for stopping by! 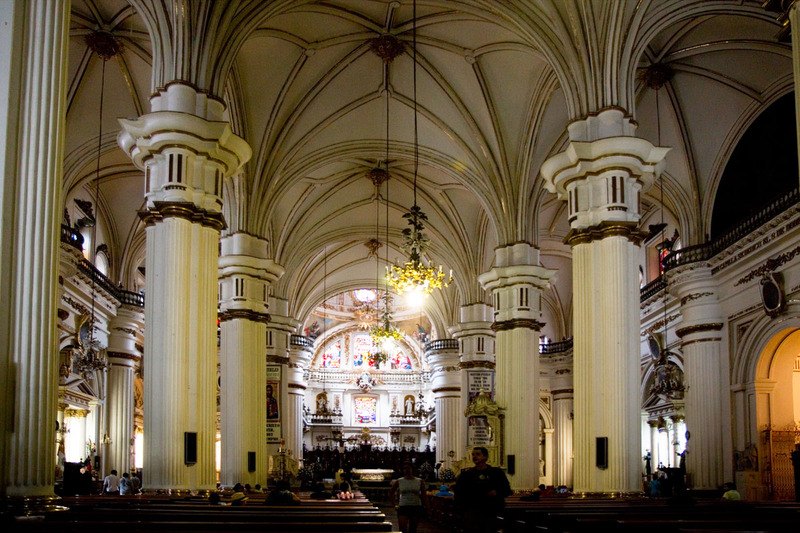 Guadelajara is on our list of places to visit, but there are other places ahead of it. I’m all about the food. I’d love to do a cook’s tour of Mexico. The architecture is secondary though important too. I have been wracking my brain to remember something I read about the bones of saints but I can’t remember the exact quote or the source. Something to the effect that if you gathered up all the bones of a specific saint, you would notice that they had miraculously increased to beyond the normal amount found in a non-holy human body. I am also of the opinion that many of those bones are of animal origin, sort of like some of the displays in Victorian Curiosity Closets where the head of one thing gets placed on the body of another. Hola Theresa! I didn’t seek out fine cuisine in Guadalajara, though I had one fairly nice Italian meal. However, I have found TripAdvisor to be a good place to scout out restaurants. A food journey of Mexico sounds like an interesting idea, though. As for the bones, I was wondering about them myself. There were a few that looked suspiciously like chicken bones. At least they looked too small to be human bones, and didn’t appear to be hand bones. But who knows? I think the custom is overall kind of ghoulish. Thanks for stopping by! Saludos! What?! He’s back in Mexico without telling us??? …but then I read the post script. Aw, post holiday blues, say no more! That Frideberg room decor is tremendous fun. Sheldon Cooper would never manage to get to sleep in this one. OMG! Fürstenfeld Abbey is definitely over-the-top. I guess that duke felt VERY guilty, as he well should have. Yes, I’m back in Boston. It’s nice to see friends, but it’s SO much fun driving around Mexico. There’s just very little adventure here. Thanks for the kinds words, and thanks for stopping by! Saludos! Coming back to the daily grind… it wears you down, doesn’t it? I’d been away for only a month, and felt pretty terrible for the first week. After a trip like yours… I can’t even imagine. Are you planning another Mx stint soon-ish? I’d like to spend the winter there, but so far that is just a vague wish. Edgar and I have been in touch in a lovey-dovey kind of way via text message, but there’s no real clarity either. So maybe Tehuacán? Maybe elsewhere? Despite the fact that I can work on the road, in reality I did almost nothing while in Mexico. Now that I’m back, my nose has really been to the grindstone, sparks flying. But I’m hopefully laying the foundation for higher future productivity. Saludos. Well, working for one’s self is, at the end of the day, a huge luxury, though not without its own peculiar challenges. But as I put it to my housemate the other day when discussing whether I’d be around for this three-day weekend, “I’ve had three-and-a-half months of vacation this year, so I don’t think I really need to get away again so soon.” So I’m here, tinkering around in the house. I think that if you lived here full time you would have a different twist on GDL. As far as historical centros GDL although important,never had the history behind it like DF does. A lot of the areas were distroied over time by fires, earthquakes and explosions etc. It is the contrasts of old vs new, quaint vs routine, low rise vs high rise that bring constant adventure as we traverse the large city. 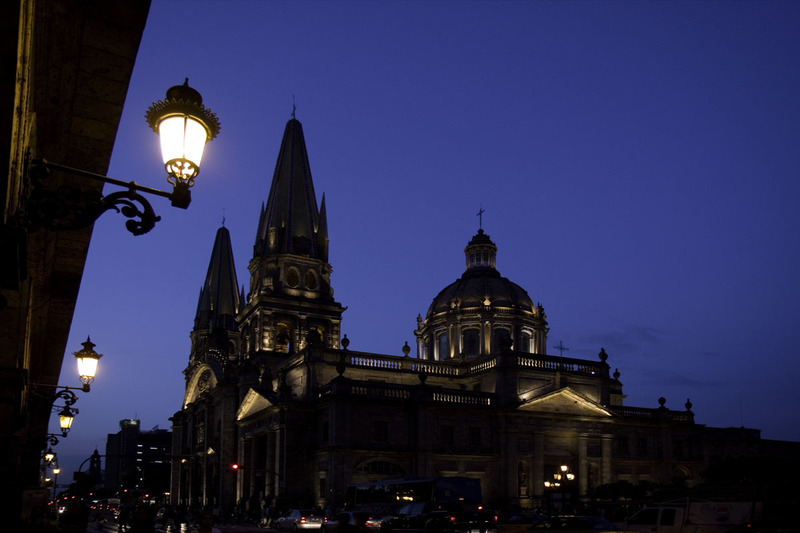 It use to be a grand experience for us years ago, but the last 5 or 8 years, Morelia has more and more things to offer that we use to go to GDL for. It’s a big city, complex and crowded and you will usually find something that will grab the interests of everyone. We especially enjoy the small plazas with art shows and street side cafes and restaurants. The wife likes the mega-malls, which Morelia is slowly catching up to. Hola Tancho! It’s not that I don’t like Guadalajara now, but my initial impression was definitely negative. But over the time i spent there, it grew on me. The people are nice and friendly, and the city has an interesting vibe. There’s also TONS I didn’t see, like Tlaquepaque and Lake Chapala among other things. It definitely has its charms, though for big-city living in Mexico, I’d go for Mexico City well before Guadalajara. Saludos and thanks for stopping by! Maybe you will make it to Puerto or Huatulco? “If it ain’t Baroque, please fix it!” Oh my! I’m still eager to meet y’all. Puerto would be a GREAT place to be in January. We’ll see. No promises. But thanks for stopping by! Saludos. Hey Kim! I agree with you about Guadalajara. I visited ages ago. I enjoyed my brief stay, and saw some nice places, but I really have no overwhelming desire to return. As for your “post-Mexico-blues”, I know the feeling. Whenever I return from a trip it takes me a several days to feel like doing anything. So, when is your next trip to Mexico? Hola Bill! I’m not sure when I’m going back to Mexico. I’d like to spend the winter there, but am not yet doing anything specific to plan for it. I do need to work, though I could do that there. Things with Edgar are also looking up a bit, so maybe Tehuacán? He and I still need to have a heart-to-heart talk, so we are still officially “status quo,” which is to say, “not BFs.” Saludos and thanks for stopping by.